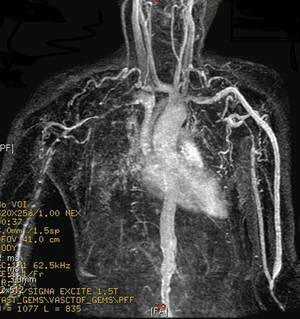 This MR angiogram of a patient with Takayasu's vasculitis was presented by Radiology Picture of the Day with a caption suggesting that Takayasu's is the only vasculitis that causes aortic stenosis. I doubted this, given the well documented involvement of the aorta in Giant Cell Arteritis (GCA) and the even more common involvement of the aortic arch vessels with stenosis. I was pretty sure I could find at least one case on the net. My search did find many cases of aortic involvement with aneurysm, dissection and rupture, but I couldn't find any cases of aortic stenosis. MRI apparently shows aorta wall edema quite frequently but intimal hyperplasia with stenosis is apparently limited to smaller vessels. A good review of the pathology/pathophysiology of the disease can be found in the New England Journal from 2003.